Lady Wellness is your source for Holistic Nutrition and Wellness. Check out the latest blog post! I don't know about you guys, but in the winter I am an absolute snack monster, the cold weather makes me want to eat non-stop! That's why I like to have healthy snacks readily available to keep my body fueled so I'm not constantly munching. These Maca Power Bites are the perfect go-to snack not only because they are loaded full of healthy fat, fibre and protein to keep you fuller for longer, but they are completely sugar-free and contain the energy-boosting adaptogen, Maca. Maca is a root vegetable that grows at a high altitude in Peru that possesses powerful adaptogenic properties. Adaptogens are herbs that have the ability to adapt to the effects of stress on the body, as well as balance hormones over time. Maca is also a known aphrodisiac and energy booster, as well it can be helpful for hormonal symptoms from PMS and menopause. If you are especially sensitive to certain forms of stimulants I would opt for gelatinized maca. This type of maca has been heat-treated to remove the starch, which aside from making it easier to digest, reduces the adaptogenic properties, giving you a more gentle boost. 1. In a blender or food processor combine all ingredients except the coconut oil and cacao nibs. Blend until nuts are mostly blended, don't worry if there are a few small chunks here and there. 2. Transfer mixture to a large bowl and mix in the coconut oil. Your mixture should begin sticking together at this point. 4. 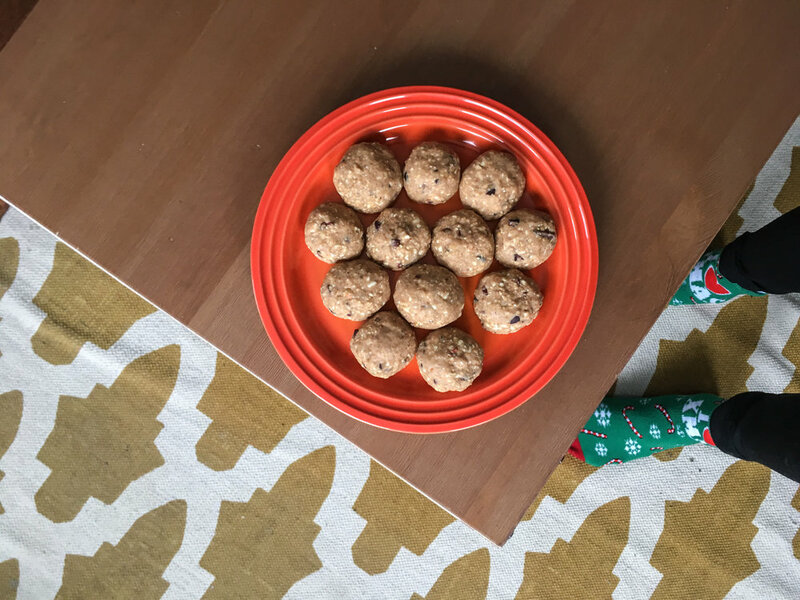 Form the mixture into small bite-sized balls and place on a baking sheet. 5. Place baking sheet in the freezer for 30mins. Store bites in the fridge or freezer to prevent them from getting mushy. 6. Transfer to a storage container and keep in the fridge or freezer to prevent them from getting mushy. 7. Enjoy on their own as a snack, crumble on top of smoothies or enjoy with yogurt! You guys asked for more snacks and I am happy to deliver! Let me know if you try any of these treats by tagging your photos #ladywellness happy snacking! My name is Laura Cobb, I am a Holistic Nutritionist, Culinary Nutrition Expert, chocolate lover, and greenery fangirl. I specialize in digestive healing, mental wellness, and hormone balance. Through food and lifestyle changes I want to inspire people to take their lives back, feel better, and achieve all they were meant to do!